4.4 out of 5 based on 490 bloggers and 239 commenters. This template looks better if you set the posts per page in a multiple of 3. Eg. 9 posts per page. In order to display the correctly, you need to follow a specific format in your posts. Check the template settings to see the format. 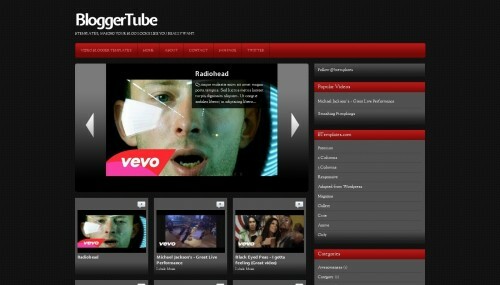 t.
BloggerTube is a free premium blogger template with 2 columns, right sidebar, gallery-styled, rounded corners, an exclusive design for Blogger, slider and posts thumbnails. Excellent template for blogs about any general topic, business, movies, music or a personal portfolio site. also how i can add facebook comments for posts? i’ve tried many scripts nothing worked..
How To Use Slider in the template help me please! Custom Blog Search is not supported in the Template. Dante please can you make a template that work with other tube sites, like xhamster or xtube….will be great something that work with all this sites. it doesn’t work anymore. any solutions? Hi. Can i use this for Image gallery instead of Youtube? I really want an image gallery site with RATING. i simply cant find one. If it’s not for images, i’d love to get help from anyone if they know a template that does image galleries with individual rating. I have the template installed but how can I get youtube videos into it? Hi, i did everything but i can’t see the videos at all..within the template. Why ? Can you help ? This is awesome template you got there ! Como hago para poder colocar videos que no sean solo de youtube?? Very nice template, but is being used by soooo many bloggers :), still it is great choice. Thanks BTemplates, for helping us. still figuring out how to custom thumbnail can dante help me figure this out? Tried to edit ang template so if you enter a thumbnail link onendofvid it will use it as custom thumbnail. Really amazing template. But is there the option of having it embedded inside another template. That is, I would like to have video streaming just inside a page located inside the template I have already designed. Is that possible? How to changed the video on date Pieter do you know it or no response? Wow.. Great template, I am looking for such a template for my new blog. Thanks for sharing it. Can someone, anyone PLEASE PLEASE PLEASE explain how this template works???? How do you get the videos to show up? How do you get the thumbnail images to show up on the home page? Nice template, but ZERO instructions came with it. I put a video and it doesn’t show up. What am I doing wrong???? Can anyone please explain the basics? I’d really appreciate it. Thanks!!! Good job!Blogger!I think it is very good. Thanks for post these template for video post. Really It is fantastic. Awesome work. Liked it. Very good and great job. why the url is https the videos don´t show? But if url is http videos show.